Killara’s Tony Fitzgerald and Andrew Talbot with steers involved in the trial. PRE-VACCINATED Hereford steers in a 70-day feedlot trial have produced lower health costs and morbidity rates for bovine Rhinotracheitis than other feedlot cattle. The trial, held at the Elders-owned Killara feedlot, Quirindi, NSW, involved 205 Hereford and black baldy steers pre-vaccinated with Bovilis MH + IBR, yard-weaned, socialised and bunk trained before feedlot entry. They were compared against 4111 British bred steers, of which 50-60 percent were pre-vaccinated against the contagious IBR respiratory disease. Killara management attributed 80pc of all cattle mortalities to BRD, and estimated performance loss due to sickness at $70-$100 per pulled animal (including labour costs and social structure upset within the pen). They draw a direct correlation between pre-feedlot vaccination and above average feedlot performance for daily weight gain and feed conversion efficiency. Bovilis MH + IBR is a combination vaccine used to protect against bacterial and viral causes of BRD. The Herefords Australia trial was held from August 4 to October 13 last year, with 205 cattle provided by three vendors. Yarralah Pastoral Co provided 109 Hereford steers and 28 black baldies, A & J Whitney contributed 25 Hereford steers and McMullin & Miles, 43 Hereford steers. The cattle were fed as one mob and the results compared to 4111 steers on feed at Killara during the same period. Over the 70-day feeding period, both mobs recorded an average daily gain of 2.1kg and an MSA index of 55.9. The Hereford pen had an average feed conversion efficiency of 1:6.1kg compared to the control pen of 1:6.04kg. On morbidity percentage (pulled and treated), Herefords recorded 9.08pc – 2.92pc less than the control pen on 12pc. Health costs for the Herefords averaged $2.80/head – $2.20 less than the control on $5/head. The trial showed no differences between the Hereford and black baldy steers. Killara feedlot trading manager Andrew Talbot said performance loss caused by BRD cost the feedlot $1.6 million a year. He suggested 70pc of that cost was avoidable, through an increased focus on health protocols on-farm leading to feedlot entry. 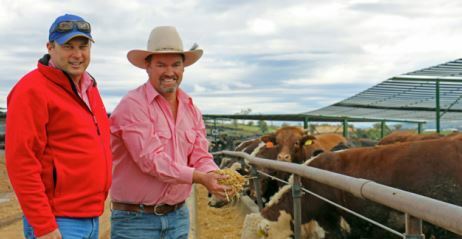 “We’re happy to buy Hereford cattle where they are pre-vaccinated, yard-weaned and prepared adequately for a feedlot program,’’ he said. Mr Talbot has worked with Killara suppliers to introduce a yard weaning and pre-vaccination program, reducing morbidity/mortality rates and increasing feed yard performance. He said pull rates in the feedlot averaged 15pc but often rose to 25pc during “cattle flu season’’ of February-March. “When we look at procurement for our domestic programs, having properly pre-conditioned calves under a pre-vaccination program is absolutely critical,’’ he said. Mr Talbot said the challenge period for feeder cattle to express BRD was from days 21 to 30 on feed. “If we need to pull 7pc of cattle in a pen at day 15, we will consider mass treating the pen (at a cost of $6/head),’’ he said. Mr Talbot said cattle were assessed on arrival on risk factors including multiple vendors and transport. “The correct pre-conditioning of cattle allows them to perform to their genetic potential,’’ he said. He said Killara paid a premium for large lines of single vendor cattle pre-vaccinated twice with Bovilis MH + IBR. “We moved away some time ago from a one-price-fits-all policy – we believe some cattle are worth more than others based on the lot size and previous performance,’’ he said. Killara provides suppliers with the Bovilis MH + IBR vaccine at a cost of $7-$8/head for an on-farm vaccination at 10-14 days before delivery. A second vaccination is carried out at feedlot arrival. “Ultimately, we would like to get to a situation where all cattle we buy are receiving two shots on-farm, and we are in the process of getting there,’’ Mr Talbot said.